The laboratory "Development and making of sensors based on MIS-structures" at the Solid state and nanosystems physics department of National Research Nuclear University MEPhi is working for almost 15 years. Under the direction of professor I. Nikolaev thin film metallic and semiconductor structures with unique physical properties are being developed. Graphite sputtered thin films of artificial diamonds as well as boron carbide and some oxides films were fabricated in the laboratory. The laboratory works are based on the fundamental and pioneer researches developed by the department members in the field of physics of the plasma, originated from laser ablated condensed matter. During the last years the laboratory is working on new types of thin films sensors sensitive to different gases (H2, D2, H2S, NO2, NH3, Cl2). Because of particularities of pulsed laser deposition technique (PLD) the sensors with salient sensitivity and stability properties are developed with superiority to world analogues. 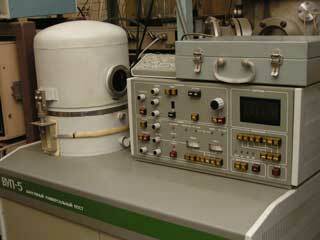 Also the novel class of gas-analyzer devices are developed in the laboratory. Such devices can be used in geophysics for earthquake forecasts and for ozone holes monitoring, in space technique for hydrogen-oxygen engines diagnostics, for atmosphere monitoring in ecology, in medical diagnostics, in the field of nuclear energetic and other fields of science and industries. There were taken a few Ph. D. degrees in the laboratory. From this Web site, you can get some information about our sensors and gas-analyzers and the list of our publications as well.